A service at the University of Redlands Memorial Chapel on the eve of Martin Luther King Jr. Day celebrated the memory and vision of the civil rights leader some 50 years after his assassination on April 4, 1968. The service included reflections and readings, as well as musical tributes—including spirituals Wade In the Water and Battle of Jericho from U of R choirs Bel Canto and Chapel Singers and an arrangement of This Little Light of Mine/Amazing Grace performed by pianist Thandiwe Sukuta ’18. After the service, we asked some of the evening’s participants to comment on what Martin Luther King Jr. meant to them. I think it is important to take advantage of this significant point in history to reflect on the many important things that Martin Luther King Jr. said, the great wisdom that he brought us, the great leadership, and the ideals. I hope we can once again recommit ourselves to that ideal, and that way of loving and living with each other… Dr. King taught us that, through compassion, all are welcome here. But there are walls still to be torn down. Let the compassion he taught us be our example. Dr. King for me serves as a role model for not being afraid to speak your mind and to stand up for things that your passionate about. To give voice to the voiceless and to push forward even when the obstacles seem insurmountable. But Dr. King also serves as a reminder to me of how far we have come and how far we need to go so that every man, women, and child in the country who identifies as a person of color has a seat at the table. Martin Luther King Jr. represents to me the optimism Black people are able to retain despite adversity. He was and still is a true example of a person who lived their truth. I always find that on days that commemorate social justice leaders, we tend to cite a quote or two and move on. However, I believe the best way to celebrate MLK Jr. day is by putting our words into action. Martin Luther King Jr. day means to "demonstrate his love for humanity," as Bernice King, Martin Luther King Jr., and Coretta Scott King’s youngest daughter, said on Twitter, because “the time is always right to do what is right." Society needs to remember the teachings of Dr. King, as the danger of history repeating itself it too real today. Dr. King changed the world for the better, and we must continue the trajectory he set forth. Martin Luther King Jr. is a reminder that, at the end of the day, it truly is hope, unity, and doing good by people that revolutionizes the world. It is hard work and perseverance that sparks change. And the movement is not only fueled by hope but by faith (iman). He reminds me that my iman will ignite a revolution for peace and tolerance and it will reverberate throughout this world. King teaches me that if we fight for what is right then we can die knowing that we tried. MLK is a reminder to me that, despite our flaws, our common humanity is what is sacred. Living and working to build upon that is our great privilege and joy. In addition to the Sunday night service, events in honor of Martin Luther King Jr. Day included community service opportunities organized by U of R’s Community Service Learning (including assembling food packages, donating debit dollars for milk, making blankets, etc.) and the Office of Alumni and Community Relations (the Orange Blossom Trail Project). 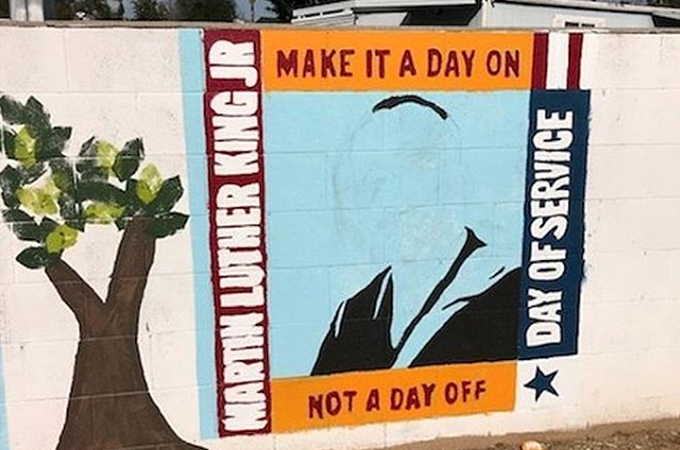 The Office of Alumni and Community Relations organized the painting of a mural that can be seen on the Orange Blossom Trail. 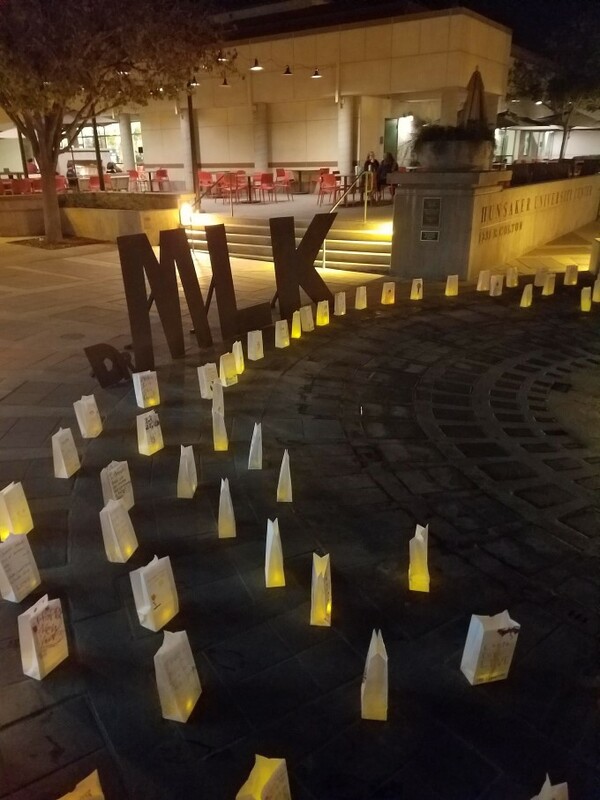 In the evening, an MLK Luminary Display in front of the Hunsaker Plaza Fountain also honored King’s legacy. 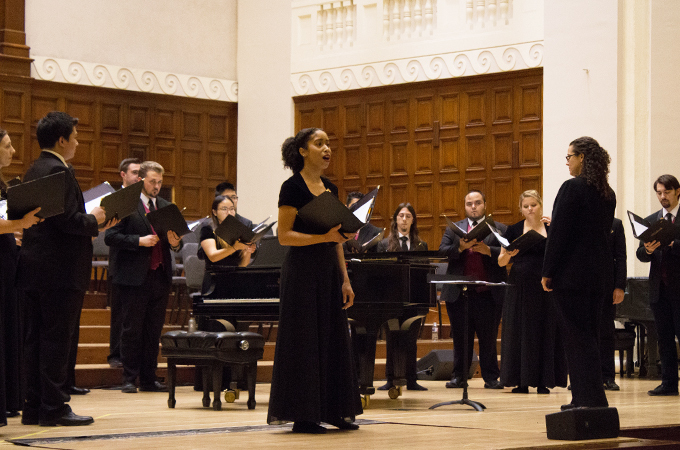 Events Campus Diversity and Inclusion Religious Studies School of Music Martin Luther King Jr.